Demand­s separa­te provin­ce, renami­ng existi­ng one as Hazara Pakhtu­nkhwa. 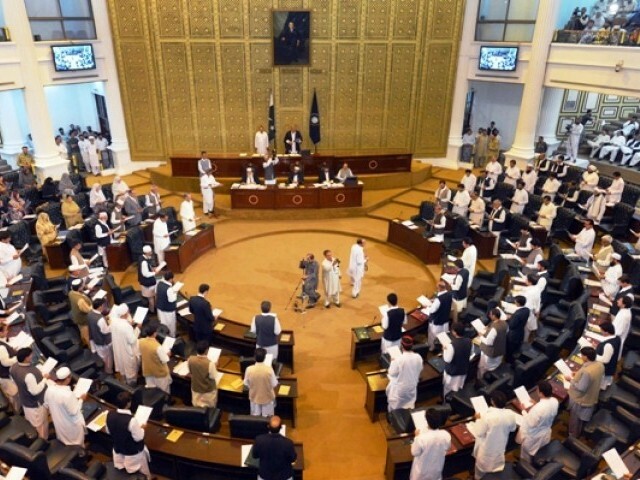 The Khyber-Pakhtunkhwa (K-P) Assembly on Friday passed two seemingly contradictory resolutions – to establish Hazara as a separate province and to change the name of the existing province to Hazara Pakhtunkhwa. Interestingly, both resolutions were introduced by the treasury benches, polarising legislators across the floor of the house. The chief minister himself exited the assembly when the resolution for a separate Hazara province was presented for approval, returning only when the second resolution regarding the name change was approved. Pakistan Tehreek-e-Insaf (PTI) MPA Sardar Idrees presented the resolution to carve out Hazara as a separate province. The Pakistan Peoples Party (PPP), Awami National Party (ANP), Qaumi Watan Party (QWP) and Pakistan Muslim League-Nawaz (PML-N), however, opposed it. The resolution stated, “[Though] the Constitution of Pakistan did not prevent the formation of new provinces on administrative basis under the confederation of the country, this house recommends to the central government, in accordance with the needs of new administrative units including Hazara province, it should present a bill for the amendment in Pakistan’s constitution in the assembly and make a commission in this regard as soon as possible. In response, Sardar Babak of the ANP argued Hazara was an integral part of Khyber-Pakhtunkhwa and hence they were opposed to the division of the province. He claimed in the prevailing circumstances, when the province was confronted with numerous problems, the resolution was a conspiracy against K-P. Babak contended no province should be made on the basis of language or race. PPP’s Nighat Orakzai chimed in saying the time was not right for such a move. She maintained they were not opposed to changing the name of the province, but would not tolerate its division. Wajihuz Zaman, however, claimed the resolution was not about the Hazara province but about administrative units, adding they never talked about the division on the basis of language or race. He reiterated they have only asked for the formation of a commission for the purpose. Ghani said the situation had sparked unrest in the past, resulting in the death of 11 people and leaving over 200 others injured in ensuing scuffles. “The judicial commission report says 1,500 bullets were fired on the protesters and the situation led to a movement for a new province from the earlier demand of renaming the existing one,” he said, referring to the skirmish in Abbottabad on April 12, 2010. Exhibiting the evident disagreement within the coalition government over the issue, senior minister Sirajul Haq said that instead of forming another province, it should be renamed Hazara Pakhtunkhwa to address the grievances of the region’s people. “The successive governments’ flawed policies have increased the sense of deprivation among the people, therefore, the federal government should name the province as Hazara Pakhtunkhwa,” read the text of the second resolution introduced by Health Ministet Shaukat Yousafzai. The resolution carried the signatures of Qalandar Lodhi, Maleeha Khan, Nargis Bibi, Mushtaq Ghani, Muzafar Sayed, Akbar Ayub Khan, Maulana Asmatullah, Wajeehuz Zaman, Mufti Sayed Janan and Faisal Zaman. Published in The Express Tribune, March 22nd, 2014. Pervez Khattak says notification to this affect was issued on Wednesday. A notification to formalise the division has been issued. Tehreek-e-Suba Hazara says it will support those parties in LG polls that back a separate province. Viva! Bravo! Shabash! O le! Mubarak! PTI Zindabad! PTI has shown more sense and practicality than the traditional parties. Let’s hope they support us for a Karachi suba??? By doing this the responsibility for education and economics squarely on the shoulders of the legislators. What people do not seem to realize is that the concept of Pakhtunkhwa envelops all the areas where Pakhtuns are in majority, and that follow the code of Pakhtunwali; in that respect, the word Pakhtunkhwa is a synonym for Afghanistan, and in purely technical terms should apply to Afghanistan, FATA, PATA, Northern Balochistan and the existing Khyber-Pakhtunkhwa! The ANP made a mistake by limiting Pakhtunkhwa to just the then NWFP, and then by compromising by adding Khyber to it; ironically Khyber is a part of FATA and not even a part of the province. With this backdrop, Hazara, if we consider it from an ethnic viewpoint is still a Pakhtoon majority province, even though overtime some of those Pakhtuns have become non-Pakhto speakers, or are bilingual! The Tarins, Hassanzais, Tahirkhelis, Swatis etc. still take a lot of pride in calling themselves Pakhtuns and intermarriages across the river are most common! Considering what I have said above, the name Pakhtunkhwa needs to be scrapped altogether, since it is an artificial split of the Pakhtoon nation, aimed at creating boundaries that should not exist! Let us revert to NWFP – because even that had a proud history of its own! Let Pakhtoonkhwa be the dream of a united nation – even if it is for the purists and the poets! A moment of truth for the tsunami youth of Pakhtunkhwa!!!!!! Dividing provinces into smaller units for administrative reasons will solve many problems. Switzerland, that has a population equal to 1/4th of karachi has 33 provinces. In best and long term interest and trend of civilized, honest and responsible approach the formulation of new province based on better administration, public service and development is very important. The Govt. and Army must consider such provisions as opportunity for national growth. Those who think new provinces as threat for the state are self-centered, non-vigilant and against the interest of the state. The Central Govt. should consider this opportunity and Assembly should approved the formation of new province even at least 14 in total. This will strengthen the state and will uproot many ethnic or other issues. The army should facilitate and materialized any such approach in the best interest of public service and state. But any division must be based on administrative service and facilitation irrespective of political or ethnic division. The only genuine demand in the country is to bifurcate Punjab and create “Saraikistan” and it’s well justified demand based on continuous plundering of resources by “takht-e-lahore” that has always kept this region poor in order to further develop Lahore(please do not lectureme the politicians from south has always been in power as Punjabi CM is morepoweful even Sindhi Prime-minister in center). KPK Govt take positively change to recommended Hazara Province Resolution that a creative thing no burden on govt even 37 province in China. More then 40 Provence at India they were do our work routine but Pakistan have 4 Provence’s but there disarrangement. .Hazar is made for Model province that like all over the world. Inshallah. His own financially power. Economic power. Natural Resources.much more………I suggest you Made Hazara Provence to not stay. But announce tomorrow instead of future…. I think PTI will be the ultimate looser as they will get vote bank in Hazara but will loose in the rest of KP. Infact, renaming might be a good solution to solve this problem. I belong to Hazara. And we are not in favor of division of the province beacuse Hazara does not have that much resources to support itself. Otherwise 1/3rd of its population would not have been in Karachi and other parts of the country. Only name should be changed. It is better to name it as “Khyber” province only so that no ethnicity comes in the name of the province. Those who are raising the voice for Hazara province like Baba Haidar Zaman are not even native people of Hazara. They are “Gujjar” commnity people who had migrated from Rajhistan in India and those Gojri speaking people still live in last number in Rajhistan and other parts of India and are running a movement for their own province even in Rajhistan which turns into violent agitaion at times. Sir with due respect we are Hindkowan peoples according to pakhto speaking peoples but when its comes to some famouse peoples of Hindkowan then they are pakhtoon what a strange is not it??? Since that aria is a mix of different ethnicities, designate the “Khyber” part of khyber pakhtunkhwa to hazara, provied them the setup they need to do thier daily business so that they don’t have to come all the way to peshawar, the problem is solved. No need for division. I’m Pashtun and I say let the Hindki people have their own province so that way Hindkis have their own homeland and can preserve their culture and language by making learning Hindko mandatory. However I do request that northern Balochistan becomes part of KPK. Hazara province will be tiny in size and significant population of it will be Pakhtuns. Sounds useless to me. Why don’t we start the division of the largest province which has been accused (rightly or wrongly) of dominating the smaller provinces? Hindko, Seriki and Bhawalpur and others can be separate provinces and were in the past and there is a movement for their own province for long. Why would we start with smashing the smaller provinces into tiny pieces and leave the real population centers? I think when the Hazara province gets formed, they should change the name of the province from Hazara to something representative of the Hindki majority population such as Hindkistan or Hindk. what happens next after the resolution is passed? A creation of new provincial assembly in Hazara Pakhtunkha? Appointment of new Chief minister for the newly made province? The very word hazara is derogatory Word. In pashto the word hazara mean the people with no specific identity. There is also a hazara region in Afghanistan because the ethnicity of the inhibitent is not defined. I belong to hazara but have been educated and live in Karachi. Gujjar people in Hazara are not natives. Gujjar people in Rajhastan, Gujrat and other parts of India speak the same or similar language as Gujjars in Hazara. See the history. If Hazara is so much feasible then why 1/3rd of hazara is living in Karachi? i m from hazara but i lieve in karachi. and i wana tolled that the 55% poeple is belongs to pushto lunguage, 15% belongs to kohistani lunguage % 30% belongs to hindko lunguage.